A lot of people are finding out the hard way that it’s difficult to get the financing for a lot of vacant land. Maybe you’re a millennial who is struggling to make ends meet, but you have thought that buying a piece of land would be a good first step towards home ownership. Maybe you’re trying to stay out of debt and you just want a small vacant lot where you can put an approved mobile home while you save up for your dream home. Maybe you just want an investment property for down the road when you’ll use it for something. Whatever the reason that you want to buy land, you’re making a fabulous decision! However, you’ve probably already encountered the problem that conventional systems are not set up to make it easy to buy land. In fact, it’s much easier to get approved for a loan on a standard home that maxes you out financially than it is to buy a relatively inexpensive piece of land. Banks often find it more risky to lend $50,000 to someone to buy a piece of vacant land than to lend $250,000 to someone to buy a home in town—even when the terms of the bigger loan are 3% down and you’ll barely be making your mortgage payment every month. As counter-intuitive and frustrating as this is, you’re not going to undo the system by beating your head against it. So how do you work within those restraints to get your land? 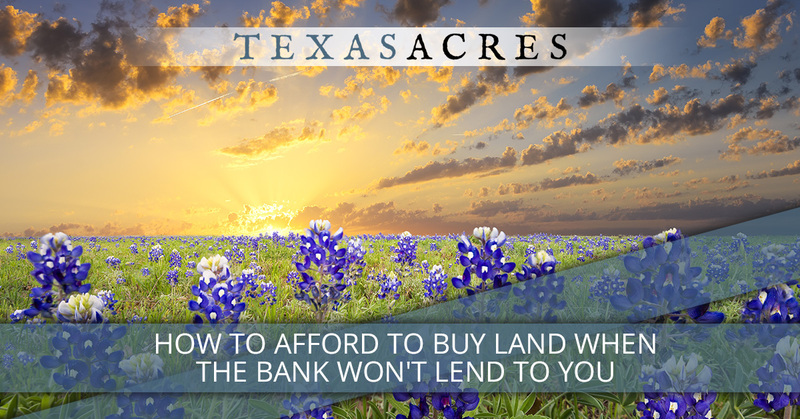 Here are three of our tips for how to buy land in Texas. Let’s face it. It’s harder than ever to save the kind of money that it takes to get a down payment together. But if you’re going to realize your dream of owning land, you’ll need to accumulate at least some savings. The people who get uncommon results are usually the ones who put in uncommon effort, and for most people, it will take nothing short of uncommon effort to save thousands of dollars. So get your game face on, learn to deny yourself in the short-term in order to get a bigger long-term reward, and start making career choices that will lead to your prosperity. This is a hard battle for everyone. But in 2018, it’s still possible to make it work. There are a bunch of tips for building great credit, but our favorite approach is simple. Get a credit card. Use it to buy one tank of gas per month. Pay it off in full every month. That way, you won’t get in trouble, you’ll never owe any interest on the card, and your credit will continue to improve. Banks aren’t the only places that lend money, and we’re not talking about going to your rich Uncle Pennybanks or some random donor, either, because—who has that kind of luck? What we’re talking about is the option of owner financing. If the bank won’t lend you the money for land, maybe the landowner will. This option has opened the doors for many people to finally be able to afford the land they’ve been dreaming of owning. Finding a piece of owner-financed land isn’t always easy, but when you come to Texas Acres, you’ll find multiple owner-financed properties available in one place, and all you’ll have to do is pick out your favorite one. Contact us today to get started with your land purchase.